UPDATE: UN-CRC reprimanded both South Africa + New Zealand for IGM practices! YAY!! During its 73rd Session, the UN Committee on the Rights of the Child (CRC) investigated Intersex Genital Mutilations in New Zealand and South Africa, expertly questioning both delegations. Since 2015, CRC has consistently recognised IGM as a “harmful practice” (like FGM) in breach of Art. 24(3) of the Convention. now 13 countries reprimanded in Europe, South America, Asia, Oceania and Africa. Besides the Committee on the Right of the Child (CRC), also the Committee against Torture (CAT), the Committee for Persons with Disabilities (CRPD) and the Committee on the Elimination of Discrimination against Women (CEDAW) have regularly recognised IGM practices as a violation of the relevant UN Conventions. Currently, also the Human Rights Committee (HRCttee) is investigating IGM as a breach of CCPR. StopIGM.org and South African and New Zealand intersex advocates, NGOs and NHRIs including Legal Resources Centre, Iranti-org, Gender DynamiX, ITANZ Intersex Awareness New Zealand and the NZ Human Rights Commission provided the Committee with evidence of the ongoing practice in both countries, resulting in repeated questions by Committee experts during the interactive dialogue in Geneva, including on New Zealand sending intersex children overseas to RCH Melbourne for non-consensual genital surgeries. Persons concerned shall later decide themselves, if they want surgeries or not, and if yes, which. 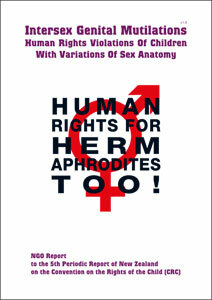 Intersex Genital Mutilations = “Harmful Practice”: UN-CRC reprimands South Africa + New Zealand!